The socialist movement was a strong influence on many of the people involved in writing the Foundations, although the specifics were often up for debate. A general history of socialism can be found in the Encyclopaedia Britannica, but some points also need to be made about socialism and Quakers. The Socialist Quaker Society (SQS) was founded in 1898 by a group of Quakers including Mary O’Brien Harris. Its core aims were to advance socialist principles among Quakers, and to persuade Quakers of “their unique position for the spread of Socialism”. It published a journal called The Ploughshare, edited by William Loftus Hare, the history of which has been detailed by Quaker Strongrooms. Many of the original members of the War and Social Order Committee were members of the SQS. The SQS lasted until 1924. The modern-day Quaker Socialist Society was founded in 1975 – aiming to provide fellowship for Quakers committed to socialist ideas, and to promote Quaker influence within the socialist movement. Their first pamphlet, published in 1977, refers to the Foundations of a True Social Order as the starting-point for their work. Many Quakers were also active in, or in touch with, the Fabian Society, a socialist organisation founded in 1884. The Fabian Society reprinted a work by John Woolman which was very influential among Quakers involved in the War and Social Order Committee. Quaker links to socialism are not limited to connection with any particular political party. 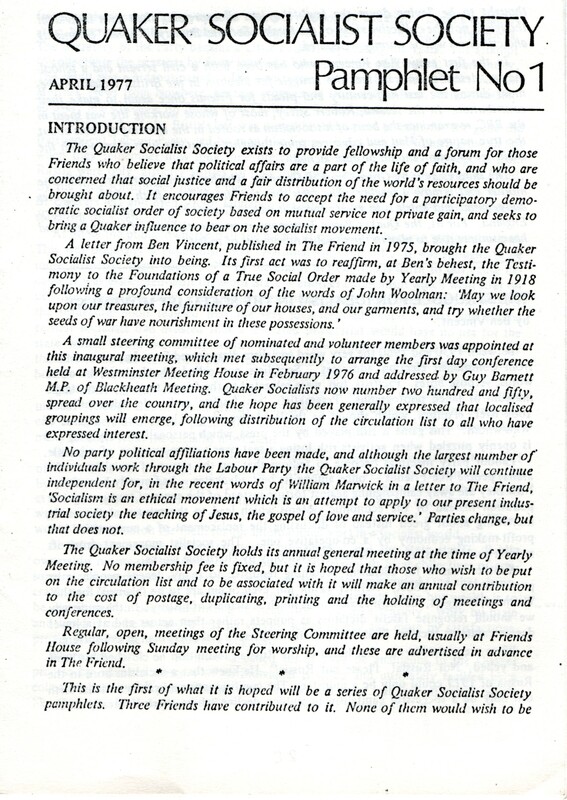 As a religious society, Quakers are often political but not necessarily party political; where individuals do have party affiliations, these change through time and with the changing political landscape of the UK; and there have been significant politically active Friends involved in all the major parties of the UK over the last century.